We’ve previously learned that Google was developing Android One, a platform aimed at developing markets. Basically it’s a system that runs well on low cost hardware. Now, the first Android One device has been spotted from a Flipkart listing, an Indian e-commerce marketplace. The listing has already been removed but not before a screenshot of the device was made. 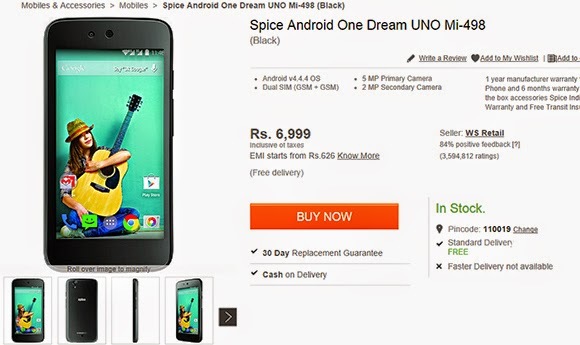 The first Android one device is called the Spice Android One Dream UNO Mi-498 and has a listed price of Rs. 6999 or roughly US$115. It has got decent specs and I think it would be a popular low-end device. There’s nothing really impressive about the specs of this device that we haven’t seen from other models in the same price point. Its advantage lies in its Android One branding which makes its software run well on this type of hardware. It will also get the necessary software updates on time compared to other Android models that will have to wait for the update to be released either from the manufacturer or the carrier. This model is going to be the first of many Android One models expected to hit the market in the coming months. The other manufacturers such as Micromax and Karbonn have been teasing their upcoming models in the social media. The Micromax Android One phone is expected to be sold exclusively through Amazon India while the Karbonn model is going to be exclusively available through Snapdeal, an online shopping place. The entry of Android One devices in the marketplace may change the way we look at low end Android devices. The common problem that we have with cheap Android smartphones is that sometimes it doesn’t come with Google services. You might also encounter problems when running certain apps. With this platform all of these issues may soon be a thing of the past.